What many journalists and politicians do not realize is that climate change warming is not global. At any given time, there are regions of the world that are warming, while at the same time other regions are either cooling or exist within a stable temperature range. An example of the actual real-world climate regime is the South China Sea denoted by the accompanying chart. A group of researchers from China produced a better methodology to reconstruct a historical dataset of sea temperatures for the month of March from 1893-2011. The findings from their research? "...above-average temperatures occurred in 1904-1913, 1929-1948, 1961-1973 and 1991-2006. Below-average temperatures, on the other hand, occurred in 1914-1925, 1949-1960, 1979-1990 and 2007-2011. What is particularly insightful about the reconstruction, however, is the absence of any apparent anthropogenic influence on the 119-year record of SST variability. In fact, there appears to be nothing unusual, unnatural or unprecedented about current temperatures. Indeed, temperatures of the past four decades have remained relatively stable over the whole length of the record." And on the other side of the world, we have the example of a cooling Ireland, which clearly seems to have missed this "global warming" that everyone in media, Hollywood, and D.C. continuously claim - obviously, without ever checking the actual evidence. But, don't hold your breath expecting either the mainstream media or politicians or celebrities pushing the climate change alarmism to inform the public that "global warming" is not truly global. Both higher and lower temperature spans during pre-industrial periods are evident in the boreal forested areas of Quebec, Canada. "Hoping to provide some additional knowledge of Holocene climate fluctuations in the boreal region of north-eastern Canada, the six researchers thus developed a new summer temperature proxy by analyzing chironomid assemblages from lake sediment cores obtained from Lac Aurelié. The new record spanned 8200 years with an average temporal resolution of 45 years." During the Holocene Thermal Maximum, temperatures were approximately 0.9°C warmer than now; and during the Medieval Warming Period, temperatures were about 1.0°C higher than in modern era. The Little Ice Age period from the 1400's to 1800's had summer temperatures cooler than modern era by 2.1°C. "In light of the above findings, it would appear that there is nothing unusual, unnatural or unprecedented about current summer temperatures in central Quebec, which fall well within the range of natural variability for this area." Referenced article on peer-reviewed study. There is the following science consensus: the anthropogenic global warming hypothesis has never been empirically validated outside the confines of a computer simulation. Essentially, across many parts of the world, the lack of warming and the lack of unusual warming - i.e. unprecedented, exceptional warming - confirms that the fear of human CO2-driven catastrophic warming is likely very misplaced. Similar to the recent scientific findings of unexceptional modern warming for many parts of the world, such as in the U.S., across Antarctica, and multiple other regions of the world, scientists in China have analyzed a 350+ year climate record and found modern warming is not unusual versus the warming of earlier periods in the record. "In general, the average length of cold periods was shorter than that of warm periods. The cold period of 1869–1877 was the longest and coldest cool period had a mean of 17.63°C. The longest warm period extended from 1655 to 1668, and the warmest period in AD 1719–1730 had a mean of 20.37°C. However, we should point out that the rapid warming during the 20th century was not especially obvious in our reconstructed RLST." The scientists also determined that human CO2 was not a factor driving the warming and cooling analyzed. "Accompanied by significant peaks at 60.2 and 73 years, the continuously periodicities around 49–114 years in our regional temperature reconstruction might tentatively be related to PDO, Atlantic Multidecadal Oscillation...as well as solar activity...The AMO was an important driver of multidecadal variations in summer climate not only in North America and western Europebut also in the East Asia...The 60.2-year peak associated with AMO demonstrated that multidecadal variations in late summer temperature in the NWSP NWSP [northwestern Sichuan Plateau, China ] might be controlled by AMO." This 2016 study from China adds to the enormous amount of empirical evidence demonstrating that an all encompassing modern "global" warming from human CO2 does not exist. The scientific evidence is unequivocal: There exist huge regional climate swaths of the globe that have mildly warmed in an unexceptional manner during the modern industrial/consumer era; and there exist multiple large areas that even lack any regional climate-significant modern warming whatsoever. Additional modern global and regional temperature charts; and historical temperature charts. And there will be climate change. This peer-reviewed study produced the adjacent charts for the regional area of the American Southwest. Although the study was primarily about climate modeling for future climate variability, it was focused on the severe climate variation of the Little Ice Age (LIA). The charts provide ample factual proof, along with the study's own premise, that our modern climate change is not unprecedented. Whether it be drought conditions or temperature extremes, the past climate was anything but stable. Note that the bottom chart shows the modern recent warming (RW) finally returning to the levels of around 1000AD and the extended Medieval Climate Anomaly (MCA) period. Simply stated: facts don't lie, and there is nothing humans can do to stop natural climate change; and, the extremes it produces without any help from CO2. Fake Climate Science: Remember When Mainstream Media, Obama & Other "Experts" Claimed Severe Weather Was Increasing? A new focused effort by a team of researchers analyzed 26 decades of hurricane activity, covering the end of the Little Ice Age (LIA) through 2012 for the Caribbean and Gulf of Mexico water regions. As most scientists agree, be they orthodox or skeptic, the world has been modestly warming since the end of the LIA. Yet the proponents of global warming alarmism "science" have claimed that severe weather, such as hurricanes, has increased dramatically due to this rather modest warming. These expert claims were primarily based on simulations from climate models (and less so on the actual empirical evidence) which has become a sure fire methodology of producing bass-ackwards fake science. This new empirical study presents the evidence from the last 260 years of hurricane activity and the result is irrefutable as the adjacent chart reveals. Not only has hurricane activity not increased across the wide areas examined, the activity has actually been on a slow declining trend. "In their intriguing analysis published in the Journal of Atmospheric and Solar-Terrestrial Physics, the four-member research team of Rojo-Garibaldi et al. developed a new database of historical hurricane occurrences in the Gulf of Mexico and the Caribbean Sea, spanning twenty-six decades over the period 1749 to 2012. Statistical analysis of the record revealed "the hurricane number is actually decreasing in time," which finding is quite stunning...as the Mexican research team indicates, "when analyzing the entire time series built for this study, i.e., from 1749 to 2012, the linear trend in the number of hurricanes is decreasing"." Additional peer-reviewed articles and severe-weather charts. It is unequivocally true that climate change, both mild and extreme, is always happening - paleoclimatology research evidence establishes that. There is no debate that climate change existed prior to humans' impact on Earth, and will continue regardless of whether human CO2 emissions persist or cease. Scientists continue to investigate past climate change events to better understand modern climate change, including extreme drought. Case in point: scientists recently published peer-reviewed research that identified extreme drought periods on Canada's Vancouver Island, specifically the British Columbia Tsable River region. Their research confirmed that since 1520AD, and prior to the instrumental record, extreme droughts took place that were of equal severity to those of modern droughts. "Severe summer streamflow droughts are impacting many watersheds on Vancouver Island, British Columbia. Small coastal basins that are the primary water source for most communities and essential to Pacific salmon populations have been particularly affected...Explaining 63% of the instrumental streamflow variability...Our findings suggest that since 1520, 21 droughts occurred that were more extreme than recent “severe” events like those in 2003 and 2009. Recent droughts are therefore not anomalous relative to the ~400 year pre-instrumental record.....The influence of the Pacific Decadal Oscillation on instrumental and modeled Tsable River summer streamflow is likely linked to the enhanced role of snowmelt in determining summer discharge during cool phases." Past extreme drought events are clear examples of continuous natural climate change that the modern era cannot escape. Humans do not cause climate change, it just happens. Previous drought and climate-history articles. Link to above image. It would seem, despite the extreme denial of most anti-CO2 activists and UN bureaucrats, that the climate has always changed, frequently making dramatic shifts. Even producing big shifts prior to the major morphing to a greenhouse gas emitting industrial/consumer society. Despite the immense treasure of climate change empirical and anecdotal evidence of time past compiled by dedicated researchers, scientists are still conducting new research to delineate the scope and breadth of past changes. "...report that (1,2) "proxy evidence does not support the tendency in simulations for wet regions to become wetter and dry regions drier in a warmer climate," that (3) their "hydroclimate reconstruction does not support a general unprecedented intensification of the hydrological cycle in the twentieth century, associated with both more extreme wet and dry conditions, as simulated by an ensemble of models," and that (4) "this finding is in line with recent analyses of instrumental data reporting limited evidence for an intensification of wet and dry anomalies under current global warming,"." Nature 532: 10.1038/nature17418. In summary, their extensive analysis of the hydrological evidence does not comport with the simulated findings of the most advanced CO2-centric climate models available (surprise, surprise). Clearly, the accompanying graph depicts the never ending condition of natural climate change, providing further proof that human fossil fuel emissions - and Exxon - are not to blame. Prior articles on historical climate change. It is indisputable that significant climate change is a never ending condition: Earth's climate, due to internal and external forces, is inconstant and variable across regions. Chinese researchers determined that non-CO2 forcings are the principal causes of majors swings in a climate's temperature, be it cooling and warming. They also determined that the modern 20th century warming, which doomsday alarmists attribute solely to the trace gas CO2, is well below the confirmed warming that took place in earlier, pre-industrial periods. Their research is based on the empirical evidence of a reconstructed temperature dataset using tree rings from China's northwestern Sichuan Plateau. This new dataset confirms what the multitude of previous studies have determined - significant climate changes are absolutely natural. "Seven major cold periods and three major warm periods were identified from this reconstruction, which might be linked with volcanic and solar activities. The Little Ice Age (LIA) climate can also be well represented and clearly end with climatic amelioration at the end of the 19th century. The 18th and 20th centuries were warm with less extreme cold years, while the 17th and 19th century were cold with more extreme cold years. Moreover, the 20th century rapid warming was not obvious in our RLST reconstruction, which implies that mean maximum temperature, as a unique temperature indicator, might play an important and different role in global change. Overall, the RLST variability in the NWSP might be associated with global land–sea atmospheric circulation (e.g., ENSO, PDO, or AMO) as well as solar and volcanic forcing"
Recently, two science articles based on the latest research belies the notion, held by global warming alarmist proponents, that climate change is only a result of modern human CO2 emissions. As skeptics of catastrophic global warming have long advised, climate change is primarily a result of natural forces that are not dependent on anthropogenic influences. An example of this earthly natural climate change is the Little Ice Age (LIA), which had serious repercussions for many, including the Mongol invaders who terrorized Europe. Researchers now believe that the underlying cause of the mysterious retreat by the Mongol invading forces of Hungary, during 1462 AD, was the bad weather - likely induced by the natural climate change associated with the LIA onset. Turns out the bad weather of climate change significantly reduced food and nutrition for the Horde's steeds and made for a very muddy terrain to battle on. And then there is the new research from another planet in the solar system that proves natural climate change is not only a terrestrial phenomenon. Research derived from the Mars Reconnaissance Orbiter has established that the Mars ice age is in the process of ending due to a natural global warming for that planet. In combination, these two research efforts add to the massive amount of scientific evidence that climate change is always occurring; and, most definitely does not require human consumer/industrial greenhouse gases to produce significant impacts on planetary environments and those associated civilizations. Prior climate-history and peer-reviewed articles. The vast majority of paleo-climate studies have been unequivocal - there are multiple past periods of warmer than current temperatures when low atmospheric CO2 levels existed. Empirical evidence, such as the Greenland ice cores, point to three specific Holocene periods of ancient historical warming: the Minoan, the Roman, and the Medieval eras. A new research study focusing on the U.S. Western area provides unimpeachable scientific data confirming warmer the temperatures that the previous studies have found. "In a recent treeline study from central Colorado, Carrara and McGeehin (2015) employed a combination of 23 radiocarbon ages and annual ring counts from 18 Rocky Mountain bristlecone pine (Pinus aristata) remnants found above the local present-day limits of such trees near the Continental Divide in central Colorado, which work revealed that the majority of the tree remnants "were established above the present-day limit of bristlecone pine from prior to 2700 cal. years BP to no later than about 1200 cal. years BP." ... "...has also been found and described in a number of other studies cited by Carrara and McGeehin, namely, those of LaMarche and Mooney (1967), LaMarche and Mooney (1972), LaMarche (1973), Petersen and Mehringer (1976), Scuderi (1987), Carrara et al. (1992), Fall (1997), Lloyd and Graumlich (1997), Doerner (2007), Benedict et al. (2008), Carrara (2011), Madole (2012), Lee and Benedict (2012), Lee et al. (2014) and Morgan et al. (2014)." ..."Clearly, therefore, there exists a wealth of real-world data from the western United States that testifies of the fact that there is nothing unusual, unnatural or unprecedented about that region's current mean yearly maximum and minimum temperatures...". This should come as no surprise since both empirical and anecdotal evidence establish that natural climate change, with wide variation and extremes, has been a constant for humanity since the beginning. Take home global warming (and cooling) message: the climate is not stable and never will be - natural climate change rules. Radical-green, progressive Democrats are now resorting to intimidation and inquisition tactics to force others into conformity with their anti-science regarding climate change. Due to their failing miserably in winning the actual science debate, they turn to coercion on those whom disagree. Unfortunately, they conveniently ignore (or are unaware) the empirical evidence that climate change is a constant, which has produced ancient and geological era extremes in weather and temperatures - extremes that science has confirmed with a cornucopia of peer-reviewed research. These extremes even took place eons 'Before Exxon' (BE), the fossil fuel giant that Democrats routinely blame for modern climate change and global warming. Above is a paleo-climate reconstruction from this study for northern Greenland. It clearly depicts the swings in 'BE' climate change from the warming of the MCA (medieval climate anomaly) to the cooling of the LIA (little ice age) and the extreme warming during the early 20th century (ETCW) from the 1920s to 1940s. "The δ18O values of the 20th century are comparable to the medieval period but are lower than that about AD 1420. …. The solar activity and internal Arctic climate dynamics are likely the main factors influencing the temperature in northern Greenland." Each of these extremes shown are a result of natural internal/external forcings prior to the gigantic consumer/industrial influx of human CO2 emissions starting post-1950. Per the abundance of climate empirical research, blaming Exxon and other fossil fuel entities for global warming is simply anti-scientific. Climate change, including that of the late 20th century, does not require a change in CO2 - a trace atmospheric gas -to happen. A group of scientists who researched past climate conditions near the coast of Japan made an interesting discovery. As the article reports, the climate in that area has not experienced any of the hypothetical CO2-caused warming that "experts" claim is global, extreme and accelerating. The chart associated with the peer-reviewed study makes it pretty clear that dangerous and unprecedented warming is absent from this part of the world. The study's authors used tree-ring samples from Japan and Russia. Their proxy reconstruction even has a fitted trend (see red curve) that suggests temperatures there seem cyclical and being driven by natural cyclical forces. Those are thought to include ENSO and the Pacific Decadal Oscillation. When one thinks about what is reported in this study, it is amazing what scientists can unexpectedly discover from research and analysis when using non-thermometer climate measurements, such as tree rings. These proxies usually come from widely scattered locations, with probably a rather sparse number of samples. In addition, tree rings don't provide a daily or monthly climate recording, unlike thermometer instruments. Yet, at the end of the day, scientists can produce a temperature record and trends over extended periods from an exceptionally low minimum of datapoints, and then their results are widely accepted by the climate science community. Sometimes one wonders about these studies. That said, these scientists identified another region of the world where dangerous and extreme warming rates are AWOL. As the vast majority of climate peer-reviewed studies confirm, there were multiple periods in the geological and ancient past that exhibited, not only extreme climate change, but also hotter temperatures prior to the modern era's huge industrial/consumer greenhouse gases. This new study regarding the Arabian Sea temperatures during winter seasons adds to the mountain of evidence that current climate change is of a less extreme variety, despite the gigantic CO2 emissions. And as this other study indicates, that extra CO2 has provided substantial benefits to the biosphere. Michael Mann's infamous 'hockey stick' graph, used by the IPCC "experts" as propaganda to convince gullible elites that modern warming was unprecedented, has had its science and respectability torn asunder by a multitude of experts over the years. The graph's lack of both science creditability and statistical robustness eventually caused the UN's IPCC to throw in the towel and exclude it from future climate reports. Climate research in recent years has confirmed that the hockey stick deserved the ash heap of bad paleo-science it now resides in. This has again been proven in the latest study, which shows the non-existence of the 'hockey stick' and the rather similar (yet less) modern warming versus that of the Medieval Period. The study's summer temperature reconstruction is adjacent. More charts indicating modern warming is not unprecedented. A fantastic book regarding the 'hockey stick' and the IPCC. Remember When Experts Said Modern Climate Warming Was "Unprecedented"? Article: This new study for the northern China Sea is just another recent example of empirical evidence supporting past research regarding the global warming experienced during both the Roman and Medieval periods. And don't forget, that for a brief period, the IPCC's "consensus experts" attempted to claim that modern global warming was unprecedented. But that attempt failed miserably when it became obvious a mountain of peer-reviewed studies easily refuted the "unprecedented" claim. Article: The myth that modern global warming is "unprecedented" continues despite the overwhelming empirical evidence that debunks the myth. This study from China provides additional proof that natural climate change is a powerful driving force that produces warning phases without human intervention. This peer-reviewed study confirms that extreme warming took place in China, at the approximate times that Europe was experiencing the warming of the Medieval and Minoan periods. Unprecedented global warming over a vast swath of the world took place in antiquity. It is accurate to conclude that natural climate change is a powerful force in terms of promoting significant temperature change regimes - simply, human CO2 emissions are not required to do so. "Using multi-proxy records -- including data on pollen, charcoal, phytoliths, total nitrogen, total organic carbon and loss-on-ignition from a 268-cm-long sediment core...The six scientists report that one of what they call the "significant climate events during this period" was the Medieval Warm Period, which held sway from approximately AD 700-1200, and which they say "was also revealed at some other sites in Xinjiang,...which was about 1.3°C higher than what had been the case at any other time over the past 3,000 years"
This chart depicts historical precipitation and temperature reconstruction from northern China. Overlaid on the chart by 'C3' are significant Chinese events from the past, along with identification of major solar states (minimums and maximums). The scientists who compiled the precipitation/temperature records and produced the reconstructions had summarized that solar influence was climatically significant for China due to the affect on annual monsoons. Using Wikipedia, major war/violence/political events were identified and then added to the chart (color bars). To the more than casual viewer, it would certainly appear that a cooler climate regime has a higher association with extreme organized violence than a warmer period. The chart's green curve indicates that those periods with less precipitation (i.e. droughts) are more common when cooler temps prevail - more arid conditions, with less food production make people (and societies) rather restless. The unequivocal and indisputable climate research clearly demonstrates that climate change is constant; and when combined with historical accounts and anecdotal evidence, warmer climates tend to favor prosperity and peace outcomes while cooler periods provide more of the opposite. Note: 'C3' originally wrote about this research in 2011. There was a recent article at Ice Age Now (and a YouTube video) using another 'C3' chart with significant Chinese events being overlaid on the Greenland ice core temp reconstructions (that prompted our doing the same for the above northern China chart). Wikipedia info page sources: here, here, here, here, here, here, here, here, here, here and here. The adjacent image represents a temperature reconstruction from the Greenland ice sheet boreholes. The image was included in a peer reviewed paper that was published in 1998, which is approximately the same time the infamous 'hockey stick' graph was produced. Although this paper confirmed the findings of a massive amount of previous research that the Medieval Warming generated higher temperatures than the current warming, the IPCC instead conferred star status to the statistically-tortured 'hockey stick' graph, which showed the previous warming to be less than the current era, and then was subsequently found to be without credible merit - a statistical travesty. Why did the IPCC go with the unproven, statistical abomination that quickly smeared (irreparably?) the reputation of climate science? "Christy’s assessment, when combined with the UEA emails, provides substantial insight into how this hockey stick travesty occurred. My main unanswered question is: How did Michael Mann become a Lead Author on the TAR? He received his Ph.D. in 1998, and presumably he was nominated or selected before the ink was dry on his Ph.D. It is my suspicion that the U.S. did not nominate Mann (why would they nominate someone for this chapter without a Ph.D.? )...Instead, I suspect that the IPCC Bureau selected Mann; it seems that someone (John Houghton?) was enamored of the hockey stick and wanted to see it featured prominently in the TAR." Additional climate-history articles. The Michael Mann self-perpetuated, embarrassing "science" fiasco continues, as described here and here. Researchers around the globe continue to build on the mountain of scientific evidence that the Medieval Period had warmer temperatures than the modern era. And the evidence for a powerful solar influence on temperatures and climate change is substantial and growing. ====> "Here we present [Editor: Chinese scientists] decadally-resolved, alkenone-based, temperature records from two lakes on the northern Tibetan Plateau. Characterized by marked temperature variability, our records provide evidence that temperatures during the MWP were slightly higher than the modern period in this region. Further, our temperature reconstructions, within age uncertainty, can be well correlated with solar irradiance changes, suggesting a possible link between solar forcing and natural climate variability, at least on the northern Tibetan Plateau." Additional climate history articles and charts. Peer reviewed studies continue to be published, adding to the unequivocal evidence that climate change was common in the past, often with temperatures higher than modern averages. The evidence confirms that modern temperatures are not unprecedented nor that human CO2 emissions are required for climate change to happen. Additional historical temeprature charts and climate-history articles. A new peer reviewed study based on an analysis of megafossil tree remains documents the indisputable conclusion: it was warmer during both the Roman and Medieval periods - ergo, extreme climate change can happen without human involvement. The above plots (click each plot to enlarge) of ancient tree lines from previous research provides ample evidence that indeed climates were warmer prior to human CO2 emissions. This new research examines 455 radiocarbon-dated mega-fossils from Scandinavian region. that mega-fossil analysis is the only methodology that can "accurately document the existence of a certain tree species at a certain spot and at a certain point of time in the past." indicates that "summer temperatures during the early Holocene thermal optimum may have been 2.3°C higher than present,"
that "the pine tree line was about 100 m higher than today (i.e., early 21st century) c. 1940 and 1300-930 cal. years BP," while noting that "the same applies to birch by c. 1700 and 1300 cal years BP," which clusters "represent the Medieval and Roman times." that "these temperature anomalies were succeeded by a distinct tree line/temperature dip, broadly corresponding to the Little Ice Age." that "the pine tree line (and summer temperature) was consistently higher than present ... during the Roman and Medieval periods, c. 1900 and 1000 cal years BP." Previous climate-history postings and historical-temperature charts. Note: Doing a search of the internet did not result in finding a definition for 'megafossil' yet a definition for 'microfossil' was readily available. For purposes of this posting, megafossil refers to fossilized material that can be viewed with the naked eye. Steve McIntyre analyzed the Southern Hemisphere historical temperature information contained in the recent IPCC AR5 report and documents an amazing discovery. Extreme, absurd cherry-picking that defies objective, impartial science. In essence, the IPCC's representation of Southern Hemisphere temperature changes is biased with unrelated Northern Hemisphere paleo-temperature datasets; the IPCC ignores established, widely accepted Southern datasets such as Antarctica's ice core evidence, as displayed here (click on image to enlarge). Not only does the IPCC avoid utilization of the the inconvenient Vostok ice core temperatures that reveal the Medieval Warming period for the Southern latitudes, they chose to use Northern datasets that have been widely criticized for being error-filled and massively manipulated via questionable, non-standard statistical techniques. Like previous IPCC reports, the AR5 edition obviously shares the agenda-science traits of absurd cherry-picking, gross misrepresentations and ludicrous fabrications, which confirms the accusations that green-alarmists have completely corrupted climate science. Note: As the chart depicts, the polar region of the Southern Hemisphere has exhibited an overall cooling trend over the last 5,000 years, with multiple peaks and valleys. This persistent cooling trend is also evident from the Greenland ice core dataset. While the polar regions share many temperature change similarities, their warming/cooling phases occur during different years/decades with different amplitude - i.e., narrowly speaking, perfect synchronization of polar climates does not exist. Additional climate-history and historical temperature charts. The light pink areas represent large geographical areas where the past Arctic climate, over the last 3,000 to 9,000 years, was warmer than today's. Recently, 'C3' posted an article regarding 15 studies that determined the Medieval Arctic warming was greater than the current warming. In addition, the adjacent bottom graphic depicts both past and modern tree lines and permafrost boundaries. This inconvenient empirical evidence confirms that in the past trees were able to grow farther north (due to a warmer northern climate) than our modern period; also, today's permafrost boundary stretches farther south due to a modern climate that is cooler. Despite this preponderance of empirical evidence and multiple peer reviewed studies about the present and past Arctic climate, a new moss (lichen) study by Miller et al. 2013 makes a bogus claim that today's Arctic temperatures are warmer than the past 44,000 to 120,000 years. This bogus claim has all sorts of scientific lameness, falsehoods and wild misrepresentations associated with it, as described by experts here, here, here and here. The criticisms of this study are extensive. But the obvious criticism of blatant cherry-picking is indisputable. As one expert pointed out, this research focused on just four moss sample sites on Baffin Island and ignored the island's 135 other moss sites' samples that completely discredit the bogus "warmer than the last 44,000 to 120,000 years" claim. As this latest study's bogus science affirms, anti-science cherry-picking remains alive and well in "scientific" circles pushing the discredited catastrophic global warming hypothesis. Just another example of 'the ends justify the means' style of agenda-science. And BTW, the top graphic does not include the recent Baffin Island icecap study and another Island study using lake sediment cores, which both confirm that the modern Arctic temps are cooler than the past. Additional climate-history and peer-reviewed articles. Climate history is replete with peer reviewed research and historical anecdotal evidence that both the Roman and Medieval warming eras were likely warmer than current modern temperatures. This new study (see adjacent plot) adds to the cornucopia of empirical evidence that natural climate change (warming & cooling) is a powerful force, taking place constantly. This research also confirms the likelihood that our modern warming is more a result of natural forces than greenhouse gases. Those stubborn facts of natural climate change are without mercy to those who espouse anti-scientific, anti-empirical claims, especially the bogus "unprecedented" claim, no? Those Stubborn Facts: Actual Climate Evidence Again Refutes IPCC's Claim Modern Temperatures Are "Unprecedented"
New research discovers ancient tree stumps that existed under an Alaskan glacier for thousands of years. The retreating glacier confirms that climate temperatures were much warmer from at least the Minoan period to the Medieval era. At some point, the climate became cooler and the actual trees were snapped at the stump level, then buried in the glacier's ice for centuries. Finally, the stumps were revealed as the climate returned to warmer temperatures in the rebound from the Little Ice Age. This actual climate evidence is corroborated by the empirical ice core dataset from Greenland. As the ice core empirical evidence depicts, the ancient periods of the Minoans, Romans and the Medieval era were warmer than the present. This Greenland evidence also reveals that temperatures have been in an overall cooling phase for the last some 3,500 years, which eventually led to the global glaciers' growth that ultimately would bury trees and forests, such as Alaska's Mendenhall glacier described in this article. This new research adds to the mountain of empirical evidence and studies that refutes the IPCC's claim that modern temperatures (i.e., global warming) are "unprecedented". Hmmm...the IPCC climate "science" always seems to be contradicted by those stubborn facts, no? The empirical evidence is irrefutable, no longer debatable. These 20 studies confirm that the known Northern Hemisphere natural climate change periods, referred to as the Little Ice Age, the Medieval Warming, the Dark Ages and the Roman Period, also had significant impacts on the Southern Hemisphere. In all cases, across both hemispheres, the large, natural climate changes took place without any human CO2 influence. This means that natural climate change is caused by other factors that are of either earthly or (and) cosmic/solar origins. Using sediment cores from two lakes in the Qaidam Basin of the northern Tibetan Plateau, Chinese researchers reconstructed temperatures back some 2,000 years. Their research was unequivocal: modern warming has been cooler than past warming periods. They also confirmed that the climate naturally made shifts between warm/cool regimes. Plus, the climate shifts appear to be associated with solar activity. Note: Historical temperature charts and previous climate-history articles. What do boreholes, varves, birds, diatoms, tree-rings, sediments, pollen and ice have common? Each has been used in a unique peer reviewed study confirming that the Arctic polar regions during the Medieval Warming Period (MWP) were warmer than the modern era. That's 15 scientific studies, using actual empirical evidence, confirming the known facts and historical anecdotal evidence. Climate change is happening constantly and naturally. And CO2 is not the cause, as determined by scientists for the 300-year drought that ended the Bronze Age (CO2 levels were at pre-industrial/consumer levels). The chart on the left was produced by Dr. Ole Humlum, who is a scientist/researcher/teacher with a deep interest in the polar regions. He is a prolific author and is responsible for many peer reviewed articles (here is a recent study of his). This chart comes from Dr. Humlum's invaluable, publicly available climate resource, www.climate4you.com. The primary dataset plotted on the top-left chart is the Greenland GISP 2 ice core evidence - reconstructed ice sheet temperatures at Greenland's Summit. The bottom-left chart represents a plot of ancient atmospheric CO2 levels that dovetail with periods shown in the top chart of temperatures. The top chart reveals the wide, extreme swings in Arctic region temperatures, which took place without any significant change in CO2 levels. On the chart, 'C3' has noted the 'peaks' of many of the temperature extremes with red dots. In addition, the points at which the shift occurred to higher temperatures are denoted with purple arrows. There are seven of these extreme upward spikes in temperatures marked in this manner. The chart on the right is a bar graph representation of the data plotted on the leftmost chart. Specifically, each bar represents the Arctic/Greenland temperature increase from the beginning point (purple arrow) of an extreme temperature increase to its corresponding peak (red dot). In addition, for each bar is listed how many years before the present (ie, 1950) that the 'peak' occurred; how many years until the 'peak' was reached from the 'low' beginning point; and, the associated atmospheric CO2 level for the given 'peak'. 6. Since the modern global warming experience has not been as extreme a 'climate change' as the natural past climate changes (in terms of duration or amount of increase) it is highly probable that modern global warming is mostly an 'under-performing' natural phenomenon with a tiny enhancement from human CO2 emissions. This actual empirical evidence clearly points to natural phenomena as being the culprits of the world's continuous climate change and warming/cooling. The fact that the billion dollar climate models, to a great degree, ignore or minimize a wide variety of these powerful natural climate forces likely explains their well documented, spectacular failures of prediction - the same goes for the consensus "experts." The new Kaufman et al. study (aka as the 'PAGES2K' research) is getting its initial web-wide forensic review in multiple articles across the web, including here, here, here, here and here. The two images above are derived from one of the study's own charts (see the Bob Tisdale article). 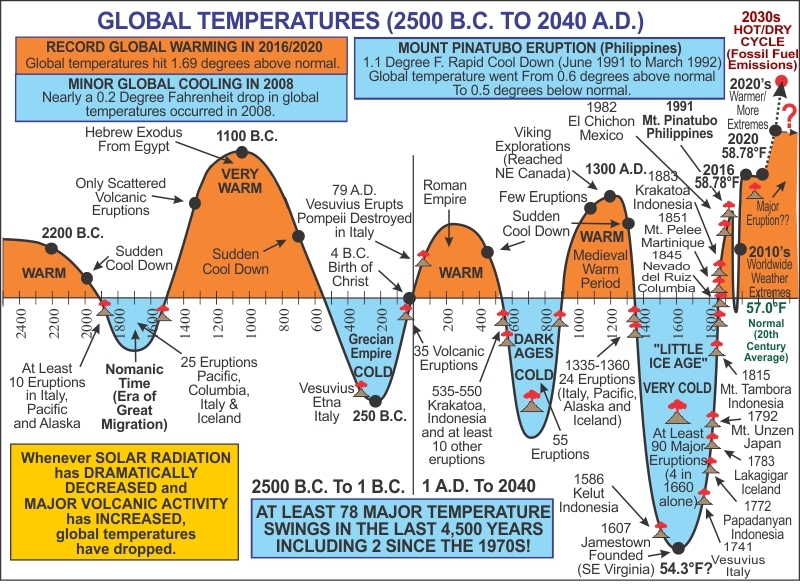 The chart on the left depicts those areas of the world that experienced modern warming supposedly greater than any warming over the last 2,000 years; and, the chart on the right represents those areas where modern warming was less than that of certain periods during the past 2,000 years. Both charts have the past 2,000 year atmospheric levels superimposed (the pinkish curve) on them. It is from the Tisdale analysis that it first becomes apparent that the law of unintended consequences has interestingly come into play - the study's authors have actually built a case (be it likely an unforced error) that supports the views of the majority of catastrophic global warming skeptics/lukewarmers. First, as even the New York Times points out, this study determined that the Arctic was warmer during the 1940s to 1970s than during years of the late 20th century. (Sidebar: If the approximate modern instrumental global warming increase of 0.85°C since 1850 is added to the Greenland ice core data, modern warming is still below peaks of the Medieval & Roman periods.) Confirms view of skeptics, check. Second, the study determined that periods prior to 1000AD had warmer temperatures in Europe. Confirms view of skeptics, check. Third, this study finds Antarctica was warmer, from the 2nd through 13th centuries, than during our modern era. (Sidebar: If the approximate modern instrumental global warming increase of 0.85°C since 1850 is added to the Vostok ice core data, modern warming is still below the peak temperature between 1AD and 1000AD.) Confirms view of skeptics, check. Fourth, this study points out that true global warming has not taken place in the modern era, but regional strong warming has. Of the 7 regional areas analyzed, only 3 exhibit a strong warming (more likely only 2, see point #11 below). The other four regions, not so much. Confirms view of skeptics, check. Fifth, the study clearly indicates that major climate change is taking place at all times, in different manners, across the globe. Climate change is not some new modern phenomenon. Confirms view of skeptics, check. Sixth, the study shows atmospheric CO2 levels are not a cause of past major climate change. Throughout most of the last 2,000 years, CO2 levels are stable yet climate change is constantly happening. Confirms view of skeptics, check. Seventh, the study documents that unprecedented regional warming takes place regardless of low/high atmospheric CO2 levels. Confirms view of skeptics, check. Eighth, this study, in combination with the known recent global temperature trend (subsequent to this study's ending date of 2000AD), clearly makes an indisputable case that recent modern global warming is not as claimed: unprecedented; unequivocal; irrefutable; irreversible; nor dangerously accelerating. Confirms view of skeptics. Ninth, this study affirms that periods of "unprecedented" warming do not cause the IPCC's urban legend of "runaway," "tipping point," dangerous global warming. Of course, the hottest period ever recorded (Minoan era) in the ice cores over the last 4,000 years already proved that the mythical "tipping point" is just that. Confirms view of skeptics, check. Tenth, this study again provides proof that the AGW-alarmist researchers will use each and every attempt to remove and/or minimize the exceptional Medieval Warming Period that the vast majority of local/regional paleo research studies, and the historical literature, have well documented. It is simply freaking amazing that this group of researchers would present an analysis of Europe's past warming without the extreme and extended warming of the Medieval era (see chart on right). Confirms view of skeptics, check. Eleventh, this study clearly proves to the public that the proponents of AGW-alarmism will utilize excessive cherry-picking of empirical paleo research to fabricate their "scientific" claims of modern "unprecedented" warming. Not only did this study exclude the preponderance of paleo-scientists' research that documents past extreme warming, but this study was brazen enough to include paleo temperature reconstructions that even a peer-reviewed science journal ultimately rejected because of its statistical flim-flam. Without the infamous, widely discredited Gergis et al. study, it is highly likely that the "Australasia" region of the above chart on the left would have to be moved to the chart of the right, above - thus leaving just 2 regions of the world that may have had modern "unprecedented" warming in the 20th century, and only a single region of the world that had "unprecedented" warming since 1970 (recall that this study confirmed the Arctic was warmer from the 1940s to the 1970s). Confirms view of skeptics, check. Conclusion: This multi-cherry-picking proxy study has many claiming that modern temps are the "hottest" across the globe, over the last 1,400 years. In fact, as the above information clarifies, some regions of the world had strong modern warming (that is, supposedly), while the majority did not. As this study itself determines, global warming, cooling and climate change are not done in some lock step manner across the world in a monotonous cause and effect relationship with CO2. Skeptics of both the IPCC's catastrophic global warming hysteria and the elites' CO2-kills fanaticism have pointed this out for years (if not decades). The geological and historical records/datasets support the essentials of the non-hysterical skeptic/lukewarmers' analysis of climate change, and now this study suggests the alarmist community has inadvertently accepted many of the same views. Additional climate-history and peer-reviewed postings and historical charts. The Climate Audit blog has another article regarding the amazing "scientific" attitudes/methods of paleo-climate "scientists" who embrace the IPCC's left-green-alarmist propaganda. The 'CA' article includes the adjacent temperature reconstruction chart of an Arctic region, spanning the time period of 800AD to 1997AD. Clearly, the Medieval Period was significantly warmer than the recent modern warming. The MWP climate warmth took place during an era of low atmospheric CO2 levels and minuscule human CO2 emissions. The evidence reveals the extended, unprecedented polar temperatures experienced prior to the Little Ice Age cooling. In another fascinating exposé of climate science flim-flam produced by yet another group of academia climate-quacks, Steve McIntyre has the adjacent chart embedded in his article. This chart represents a 5,000 year span of temperature variation in the Arctic region (Ellesmere Island) per peer-reviewed research . To add context, we superimposed the atmospheric CO2 levels (mauve curve) from the last 2,000 years. 1. Climate change is a science-proven constant. 5. CO2, be it natural or human, is not the globe's "thermostat"
Finally, per the HockeySchtick blog, it is known that the essentially barren Ellesmere Island had temperatures some 2 to 3 degrees higher than current temps, despite the gigantic CO2 emissions of our modern consumer/industrial era. Additional climate-history and peer-reviewed postings. More historical temperature charts. Read here. Scientists from Europe and Russia reconstructed temperatures from a Kamchatka Peninsula sediment core that contained chironomids. As the chart on the right depicts, the scientists determined that there were extended periods, well before CO2 atmospheric CO2 levels of 350 ppm and greater, when summer temperatures were well above modern temps. Additional climate-history and peer-reviewed articles. Other historical-temperature charts. Read here. The U.S. has a research station located at the WAIS divide where scientists associated with the Scripps Institution of Oceanography conducted an analysis to determine the Little Ice Age impact on the southern polar region. Additional climate history and peer reviewed articles. Historical temperature charts. Read here. The empirical research for the unprecedented temperatures during the Roman and Medieval periods continues to build. As this chart depicts, the New Mexico region of the southwest U.S. experienced considerably warmer temperatures than those of the modern era. As can be seen, extreme climate change took place frequently in the past, well before any influence of humans on the landscape and the atmosphere from CO2 emissions. Nope, we're not speaking of Obama's first birthplace, the one before he decided to run for U.S. president, although Kenya does have a warm and humid climate. Instead, the research was done in the Hawaii area, the newer birthplace of Obama after his U.S. Senate election. Specifically, the study was done at the scenic Kealia Pond, Maui. These scientists wanted to determine what impact the MCA had on the tropical island, where the UN's IPCC scientists had claimed there was no impact. As scientists dedicated to the scientific truth, they ignored the IPCC's dictates (i.e., flimsy reasoning) and pursued their research. Regardless of which falsehood of Obama's birthplace one chooses to believe, there is no choice concerning the truth regarding the Medieval Climate Anomaly. Its impact has been substantiated by reams of empirical research and peer reviewed articles. The Medieval Warming Period impact was immense, stretching across the entire world, even touching the tropical islands of Hawaii. Additional climate history and peer reviewed postings. Read here. As several new 2012 studies of the Arctic and Antarctic regions have determined, modern warming is not unprecedented versus the Medieval and Roman periods. The current research coming out of the polar regions is confirmed by a group of European scientists utilizing the latest research technology in a non-polar region. As can be seen, this new research from Esper et al. is depicted adjacent - clearly, summer temperatures during the Roman period, sans consumer/industrial human CO2 emissions, were significantly warmer than the current period. Conclusions: As the irrefutable empirical research mounts, it is becoming untenable for politicians, regulating bureaucrats and taxpayer funded scientists to maintain the falsehood that modern global warming has been unprecedented. The latest objective, scientific research from across the world confirms that modern warming is not unusual, nor dangerous. In addition, the preponderance of new research indicates that both the Roman and Medieval Periods were warmer. Read here. Canadian Arctic experts have conclusively determined that the Arctic's Northwest Passage has frequently been devoid of sea ice during summer months. This lack of sea ice was the result of natural warming that produced excessive temperatures. They conclude that temperatures during the Medieval Period, and multiple earlier periods, were significantly warmer than modern temperatures - from 1 to 3 degrees warmer. "Numerous sites have been surveyed along the length of the Northwest Passage. The eastern and western approaches have become reliably ice-free in summer under historical climatic conditions, whereas in the central part summer sea ice has been persistent. The radiocarbon-dated bowhead whale remains indicate that the whales were able to range along the length of the Passage during two intervals (centered on 9000 years ago and 1000 years ago) and that they were able to access the central part from the east about 4000 years ago. During the first of these intervals (9000 before present) ice cores indicate that summer temperatures were about 3°C warmer than mid 20th Century. Therefore, a warming of 3°C exceeds the opening threshold. Medieval Warm Period temperatures were probably about 1°C warmer than mid-20th Century, which is likely close to threshold conditions for an opening of the passage." When compared to the historical and ancient past, the modern Arctic warming and subsequent summer sea ice melt is not unusual, and is likely the result of the same natural climatic patterns and oscillations that produced such conditions in the past. As revealed in the adjacent series of images, the modern sea melt (image3 at the bottom) still has not freed the Northwest Passage of summer ice as the experts believe the earlier warming periods easily did (image1 and image2). Conclusions: Modern Arctic warming is not unusual versus the Medieval Warming. Current Arctic and Northwest Passage sea ice melt is less than what occurred in the past, per the empirical evidence. Since both modern and historical Arctic warming, and sea ice melting, are similar, one can surmise that natural warming is the principal cause of today's Arctic conditions. Plus, anthropogenic black soot and greenhouse gases may have exacerbated the current sea ice melting. Previous climate-history and polar-sea-ice-sheet postings. Historical and modern temperature charts. Read here. Paleo-climate research continues across the world and the vast majority of new studies confirm that earlier periods were warmer than our current climate. And the newest research establishes the same for Canada's Yukon region. Conclusion: The Medieval Period had the unprecedented global warming, not our modern period. The Medieval warming took place during a time of low atmospheric levels of CO2, well before the modern growth of CO2 emissions. Prior climate-history and peer-revewed postings. Additional historical and modern temperature charts. Visit this climate history temperature chart page and then scroll down that page to witness how temperatures have changed from millions of years ago to those more current. The above linked page represents a visual presentation of a wide selection of peer reviewed studies. These charts make it abundantly clear that researchers have conclusively found that our modern temperatures are not so "unprecedented" nor so unusual. Likewise, it is obvious that this actual climate history (sans models) proves that the global climate is highly variable and makes abrupt changes, without any human CO2 emissions. This plethora of empirical evidence represents years of scholarship and should be a constant reminder to policymakers of one for sure certainty: that our current climate and temperatures will change, and there is nothing we can do to change or stop that highly complex and gargantuan natural process. Read here. The Copard et al. team, using gravity core empirical evidence, reconstructed past temperatures of the northeastern Atlantic region. Their research proves these waters off the coast of Ireland experienced higher temperatures during the Medieval Period than those of today. Previous climate-history and peer-reviewed postings. Historical temperature charts. Read here. The IPCC's known political agenda requires it to publish "science" that purportedly establishes modern warming as unprecedented. One of the results of this agenda was the infamous and now discredited study known as the 'hockey stick'. Unfortunately for the IPCC, the vast majority of scientific research confirms that ancient and historical global/regional temperatures do not resemble a hockey-stick with modern warming being higher than earlier periods. And now new Chinese research by Wu et al. has determined the same - there is no hockey-stick. Conclusions: The actual global warming science facts are again confirmed by the newest research. The IPCC's discredited 'hockey stick' was indeed bogus science. Unprecedented ocean temperatures (and regional/global) occurred prior to the modern era of growing consumer/industrial CO2 emissions. Previous climate-history and peer-reviewed postings. Read here. The image on the left is Lake El'gygytgyn in Siberia. Scientists have been able to extract high resolution sediment cores from the lake that have recorded climate changes over the last 2+ million years. From their analysis, a team of scientists (Melles et al.) have documented at least 8 significant warming periods in the past, with some exceeding modern temperatures by 5 degrees. The research indicates these warming periods can last for thousands of years without the aid (ie, cause) of increased levels of atmospheric CO2. Conclusions: This research finds that past extreme warming and climate change were not CO2 caused - the empirical observations from the past don't support the IPCC's version of the AGW theory. Extended warming periods do happen naturally without human contribution. Natural warming can be very dramatic. Those are the global warming science facts. Read here. The UN's IPCC is not a climate science research agency. Instead, it is a bureaucratic political agency charged with "proving" human greenhouse gases (ie, CO2 emissions) are causing "unprecedented" global warming and climate change. It conducts no original research, instead relying on cherry-picked peer reviewed studies and non-peer reviewed reports from green activist organizations. It prefers research studies that happen to also rely on cherry-picked data and/or flagrantly absurd statistical methodoloiges that produce the infamous hockey-stick presentation of past temperatures. The classic case of this IPCC-style of science, that's since been discredited, is this study and the most recent hockey-stick fiasco that had to be withdrawn is this one. Because of the easy access to knowledge and information that the internet now provides, we can also discover the past and more current peer reviewed studies that the IPCC chose to avoid, ignore or dismissed because they did not support the political objective of proving the climate evils of CO2 greenhouse gases. One such report from the past that was ignored was conducted by Japanese researchers, which confirmed that modern climate change was not unusual but part of a natural pattern. Conclusion: Extreme climate change as represented by significant global cooling and global warming periods over the past 2,000 years, is a natural phenomenon. Thus, modern global warming that took place over the late 20th century is not "unprecedented." Read here. New study documents Medieval Period winter temperatures that are significantly higher than those of the modern global warming. This latest evidence comes from the Svalbard archipelago - Longyearbyen is on the peninsula of Spitsbergen, the largest island of the Svalbard archipelago. It is the world's northern-most town, with all settlements further north being research or meteorological outposts. Conclusion: Modern global warming is not "unprecedented." The Medieval Period was a hotter era than our current climate. These are the simple global warming science facts that the empirical evidence corroborates. Read here. The IPCC continues to proclaim that modern warming (okay, the IPCC does concede that the "warming" has disappeared over last 15 years) is "unprecedented." This proclamation is made based on the UN's political agenda and not the actual empirical research and evidence. A plethora of peer reviewed studies provide absolute confirmation that prior periods were indeed warmer than our modern era; that both warming and cooling affected the entire globe and not just the European/North Atlantic region; and, that the significant prior climate change was entirely natural, not from human CO2 emissions. A new study by scientists Fletcher and Moreno provides proof from the Southern Hemisphere that natural global warming is a powerful climatic force that is empirically irrefutable. Conclusions: Natural causes of global warming and cooling are well documented, not only by anecdotal evidence, but from global empirical research of peer reviewed studies, including evidence from the Southern Hemisphere. It is a scientific travesty that the IPCC rejects the findings of the vast majority of peer reviewed research and instead relies on a handful discredited hockey-stick papers that use the same proxies over and over, and then employ absurd statistical tecniques that can't withstand professional scrutiny. By denying the natural Medieval Warming, the IPCC clearly establishes that the UN political agenda supercedes the actual science. Read here. The reality is that climate change just happens normally as the world goes through its typical warming and cooling phases, including the Southern Polar regions. Yet climate doomsday scientists insist on claiming that modern Antarctica warming is "unprecedented" - but is that really true? Another peer reviewed study, this one by Lu et al., has determined that present-day warming has not reached the levels of the Medieval Warming era, which confirms unprecedented warming is not happening. Conclusions: The ruse of Antarctica "global warming" continues to be undercut by the empirical evidence, both historical and modern. As of 2012, the modern warming of the Antarctica Peninsula is not "unprecedented" no matter the claims of climate doomsday scientists. Read here. Global warming alarmists and hysterical pundits/reporters are now apparently turning every nasty weather event into "proof" that current global warming is causing extreme climate change. Unfortunately for said alarmists, the empirical evidence completely undercuts claims that warming causes bad weather - essentially, the claims are all hype for several reasons. One, there has been no global warming for the last 15 years - the climate observation datasets are unequivocal about this. Two, from the recent past, it is well documented that very severe weather has been part of our climate over the last 100 years, well before the modern warming from the late 1970's to the late 1990's. Three, EU scientists (Sabatier et al.) have now documented that severe weather was worst in the historical past when temperatures were colder, not warmer. Conclusion: The claimed extreme climate change and associated severe weather events over the last 15 years are not the result of "global warming." In addition, historical empirical evidence makes it clear that severe weather incidents increase as the climate cools, not when it warms. It is well established that the past cooler climates have had profound negative impacts on society whereas warmer climates have been more beneficent. Previous climate-history, severe-weather and peer-reveiwed postings. Climate and temperature charts.